The game uses standard European Blackjack rules. This means the dealer stands on all 17. Splitting is allowed, but only once per game. Aces may be split, but each new hand then takes only one card before you must stand. 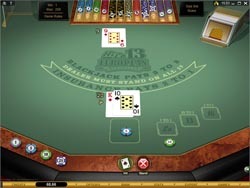 Players can double down on 8, 10, or 11, but never after a split, or of they have been dealt blackjack. The side bet adds some additional rules. The wager is on the total of the player’s first two cards, and becomes available once the main wager has been placed. There are three ways to wager, and players can even wager on all three, making the bet a sure-win. The max bet for each is 25 credits. This game looks as good as it plays. The table is crystal-clear, with bold cards and chips. Subtle animations and visual effects add a very nice touch. The subtle background music and murmur of the casino crowd work great to set the scene. The only complaint we have is that the chip rack at the top of the screen is tiny and hard to see, but since it’s not an essential part of the game, it’s not really important. Overall, the game gets top marks in this category. The Hi Lo 13 side bet is a tricky one, especially since players are allowed to wager on all three (Hi, Lo, and 13) outcomes at once. It seems that the best bet would be to wager on all 3, which guarantees a win. This is indeed a good strategy, but it’s actually the same as just betting on 13. This is because the Hi and Lo bets pay 1:1, so if either is won, it pays for the other. In the end, the best wager to make on this side bet is to only bet on 13. The best part about Hi Lo 13 is that it’s basic European Blackjack at heart, and the side bet is completely optional. This means players can spend most of their time playing a regular game, but can throw in a side bet now and then for good measure, just to see what happens. It’s a fun way to spice up the game, and it’s only available from Microgaming!